*Katharina Frei* - Kreatives Sammelsurium: Happy Birthday Noah! 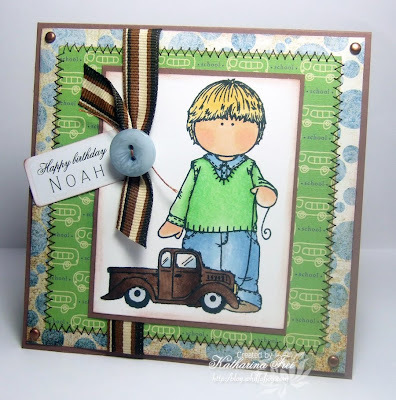 I nevertheless managed to do a little card yesterday for the 2nd birthday of my son's friend Noah. I used the cute Hänglar & Stänglar boy and coloured him with Copic Sketch Markers. I generated the text on the computer and cut it with my Spellbinders tags trio die. Ich habe es trotzdem geschafft eine Karte für den 2. Geburtstag von Noah, ein Freund meines Sohnes, zu machen. Ich habe den süßen Hänglar & Stänglar Jungen mit Copic Sketch Markern coloriert. Der Text ist am Computer generiert und dann mit einem Spellbinders tags trio die ausgestanzt. The above photo shows the colours I used to colour the image. Thanks for visiting and take care! Total schön geworden und so passend für den kleinen Freund Deines Sohnes :) Eine richtig süsse Kleine-Jungs-Karte! Mensch Katharina.. ich wünsch Dir ganz schnell GUTE BESSERUNG und hoffe Du hast bald alles gut überstanden und bist dann wieder richtig fit und munter..aber lass Dir mal bloss Zeit wieder richtig gesund zu werden!!! Süße Karte für einen kleinen Jungen. Oh Katharina I am so sorry that your health is not improving. I really hope that you will be well soon. Your card is just so adorable I love it. Your colouring is so supurb and your paper and detail so perfect. sorry to hear you're sick. I'm wishing you well real soon. Your card is so adorable and I love the colours on the Hanglarboy. Die Karte ist richtig toll geworden. Das Motiv passt aber auch super zu einer Jungen-Geburtstagskarte. Hope you are feeling better soon Katharina! deine Karte ist wunderwunderschön geworden. Thats a lovely little image, so useful. Love your colouring. Hope you feel better soon. 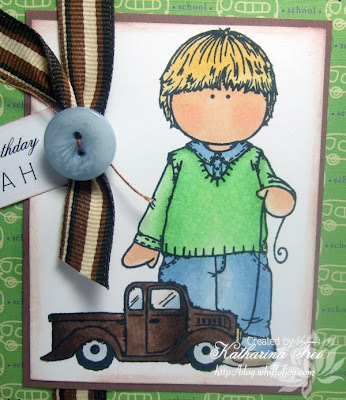 Cute boy card, love those stamps, get well wishes for you, hoping that warmer weather is on its way and everyone is well again. Best wishes. woww Katharina,what a gorgeous card,l love the colours. Hope you manage to shake off this virus soon! Poor you Katharina, this sounds really horrible nothing worse than a viral infection they can take so long to clear. Thinking of you dear. huhu katharina! schönes kärtchen, die farben passen toll zusammen. I'm looking for boy stamps too! Your card is also very lovely! Hi Katherina Hope your feeling well soon, love your card and the colours your such an inpiration. Great colouring and great layout. So cute for your littel boy!! I hope you start feeling better soon!! Katharina, this is absolutely adorable. =) I'm just sorry to hear how your health is not improving. This has been going on for a long time now. I hope that this virus will soon be finished, and you will be back to your usual self again. Die Karte ist so klasse geworden. Deine Karten sind auch immer toll coloriert. Ich war in letzter Zeit schon oft auf Deinem Blog und bin begeistert. Leider komme ich nicht immer zum kommentieren. Ich wünsche Dir gute Besserung und dass es Dir bald wieder gut geht. Hoffe Dir gehts bald wieder besser Katharina!!! Kopf hoch! Wunderschoene Karte ist das geworden! Klasse! Hello Katharina, I love how you coloured the hanglar image in with the copics and I bet Noah will love it. hi Eba, yes Willow with Umbrella was out of stock be we already got some with more to come but it is back in stock now. bin immer wieder begeistert wie liebevoll deine Karten sind, auch diese Karte ist so knuffig und lieb..